Today I have something other than a card for you , I made a Ticket Stub Memory Box for a friend’s son , he needed a home for all those ticket stubs he has collected from the movies , concerts , ball games and maybe even plane tickets to fun places , this was a birthday gift from me and will be something that will grow with him , even into adulthood this can be displayed him his home . 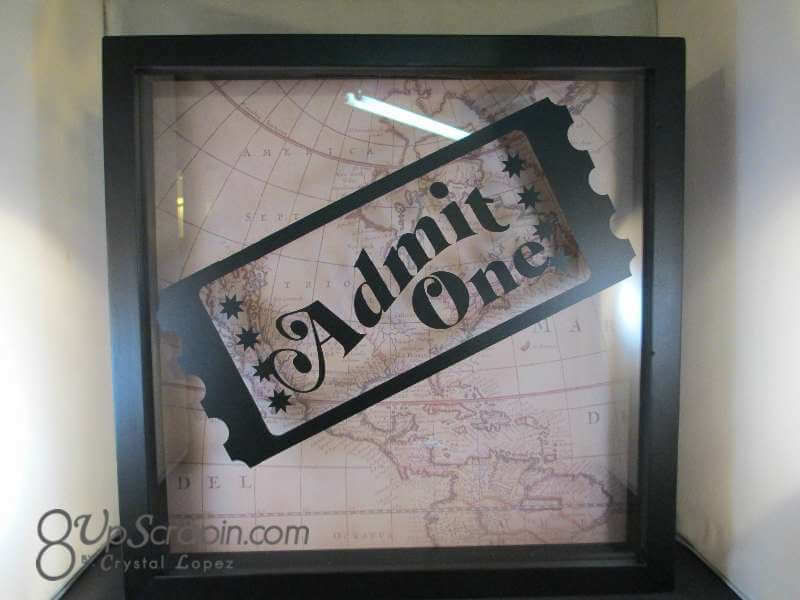 sorry for the glare on my picture ..
so I used a 12 x12 shawdow box and used a RotoZip to cut a 3 1/2″ slot at the top and then painted the newly exposed wood black then I opened up shadow box and added a vintage map paper to the background to represent the journey or travels he will do , next I cut a ticket sub from black orcal 651 vinyl from my Silhouette , the cut is from the Silhouette store its an ecko park image , you weed the image and layer it together using the transfer tape and burnish it to the glass . I truly love how this turned out and plan on making more , I think we need one for my daughter . Thanks for stopping by to see my latest creation , come back tomorrow and see what I make next ..